This March, CIMA returned to the highly influential SXSW music festival in Austin, TX with a delegation of 21 Canadian music companies and 25 artists for a showcase and business mission that included: the Canadian Blast BBQ, 2-days of Canada House, a Meet the Canadians networking reception and 2-days of Country Connections B2B sessions. This year Canada House became a “one stop shop” for Canadian delegates and their artists as the Canadian Blast BBQ moved from Brush Square to Swan Dive on Red River St. The venue also received a decorative overhaul as the entire front and interior were skinned with Canada’s signature uniform of ‘buffalo plaid’. On Wednesday afternoon, in advance of the BBQ, CIMA hosted an invite-only Meet the Canadians networking reception at Swan Dive. In total 180 Canadian and international delegates got the opportunity to grab a bite and mix and mingle before the music began. The Canadian Blast BBQ took over the outdoor stage at Swan Dive for an afternoon of great Canadian music featuring Cadence Weapon, Partner, Yamantaka//Sonic Titan, AHI, Lisa Leblanc and Dear Rouge. The BBQ was near capacity at 325 outside for most of the afternoon with 286 international and Canadian delegates in attendance. The first half of Thursday’s daytime showcases were all about the West Coast, as BreakOut West (Manitoba Music, Alberta Music and SaskMusic) treated attendees to a taco breakfast and then hosted 3 hours of music featuring: The Hearts (AB), Ghost Twin (MB), Living Hour (MB), Samurai Champs (SK), Strvngers (AB) and Boniface (MB). Universal Music Canada, in partnership with the SOCAN foundation, took over Canada House for the remainder of the afternoon on Thursday with a cross country showcase featuring Milk & Bone (QC), Le Couleur (QC), Said the Whale (BC), Savannah Re (ON), Dizzy (ON) and Dear Rouge (BC). On Friday afternoon we ventured back to the middle of the country with the Bring It Ontario showcase presented by the OMDC and MusicOntario that featured Greys (ON), Terra Lightfoot (ON), Common Deer (ON), Grand Analog (ON) and Tasha the Amazon (ON). The City of Toronto hosted the final showcase at Canada House this year with performances from Casper Skulls (ON), TiKA (ON), AHI (ON), Weather Station (ON) and Yamantaka//Sonic Titan (ON). Both TiKA and Tasha the Amazon’s showcases were supported by Women in Music Canada. Artists performing at Canada House were alternated between indoor and outdoor stages allowing for two afternoons of non-stop music. The alternating stages also allowed delegates a unique opportunity to network and take meetings at the venue while taking a quick break from the music. Over the two days, Canada House was near or at capacity with approximately 250 attendees inside and 325 outside. The music continued into the evening at Canada House on Thursday and Friday thanks to our Canadian nighttime presenters Dine Alone Records, Halifax Pop Explosion, BreakOut West, Pop Montreal and M for Montreal. Amidst the showcasing, CIMA also delivered our highly-targeted business initiative with Canadian companies participating in four successful B2B and networking events. 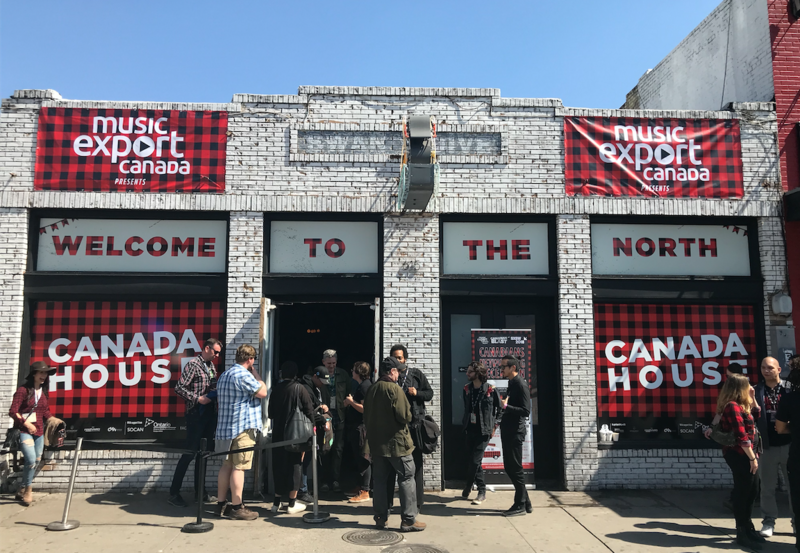 This year CIMA partnered with Tele-Film to present a Canadian reception on Tuesday evening to bring together film and music companies during the crossover day at Tele-Films RDV Canada venue on Rainey street. The business events also included two morning sessions of Country Connections, a joint B2B event with partners DIT (UK) and Sounds Australia, at the British Music Embassy. On Friday, a 2-hour “Focus on USA” speed meeting session which allowed delegates from the UK, Canada and Australia to meet with industry from the US in round table discussion groups. In total 125 delegates attended Friday’s session. On Saturday, “It’s A Small World” speed-dating session took place with 120 participants from the UK, Canada, New Zealand, Ireland and Australia. CIMA gratefully acknowledges the generous support of our Canadian partners and sponsors: Canadian Music Week (CMW), the Foundation Assisting Canadian Talent on Recordings (FACTOR), the Government of Canada (through the Canada Music Fund), Harvard Broadcasting, Ontario Media Development Corporation (OMDC), Stingray Music, the Society of Composers, Authors and Music Publishers of Canada (SOCAN), SOCAN Foundation and the Radio Starmaker Fund.